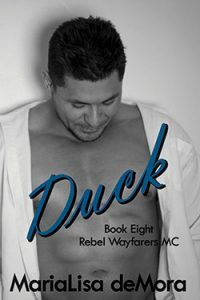 Frustrated, he trailed off, looking down at the bar in front of Davis Mason, national president of the Rebel Wayfarers, a motorcycle club he had recently patched into as a prospect. He was trying and failing to explain why he needed to head out of town tomorrow, which would mean he had to bail on a club party this weekend. As a prospect, that kind of thing just wasn’t done. A prospect’s life was the club, and he was expected to be in attendance at all events. Lifting his head, he looked Mason in the eye, trying to convey the depth of his commitment to this woman. “My brother hurt her. I could have stopped it, should have, but I didn’t. I ran like a coward, leaving her to pull her own fat out of the fire. Friday night, tomorrow…he will be heading into her town, down where she’s going to college. After everything he put her through, she’s just getting her life back on track, barely starting to make her own way again. He’s a hell of a threat from a distance, now he’s rolling into town and she doesn’t have a clue. I can’t let her down again. With a nod and a chin lift, Mason wordlessly interrupted, giving him permission. Reuben sucked in a harsh breath of relief, knowing he would have been going anyway, but this way, Mason made it easy for him. Easy for him to keep his solemn—if unspoken—promise to make up for his cowardice. For walking away, for closing his ears to the tortured screams coming from the rig. For letting his brother touch something that was sassy, sweet, cute, and loved, breaking that beauty in ways Reuben knew would never be healed. He couldn’t undo the past, no matter how much he wanted…needed, even prayed for a chance to walk a different path. He couldn’t change history, but he could hold tightly to the future. And he would. He had promised himself he would. For the rest of her life, Mica Scott would be safe from Ray. Reuben would make sure of it. She wouldn’t see Ray, didn’t have to think about him, and—please, God, someday—she wouldn’t have to remember time spent with him and what he’d done to her. No skeletons in her closets to bring her grief. Not as long as Reuben could keep her safe.